What types of health information are consumers compelled to divulge under Affordable Care Act rules? I just selected a new health insurance plan and they’re asking me questions about my health. I thought insurance companies can’t do this anymore? Under health care reform laws, insurance companies can’t require you to answer health questions in order to buy insurance. However, once you are covered by a health plan, companies are allowed to ask questions to determine whether you qualify for one of their disease management programs or for case management services. Disease management programs help consumers learn how to manage chronic health conditions such as diabetes, heart disease, or depression. Case management programs help consumers who have very serious health conditions, such as leukemia, cut through the red tape to get the insurance company to pay for their treatment. For example, to prevent misdiagnosis, some insurance companies won’t start paying for cancer treatment until consumers get a second opinion to confirm the diagnosis. The average consumer wouldn’t know this, but a case manager will tell the consumer about this requirement and, if necessary, help the consumer schedule an appointment for a second opinion. Many case managers are also licensed nurses, so they can also suggest solutions to problems, such as side effects, that consumers experience during treatment. Both of these services are voluntary, so you don’t have to answer the questions. Even if you do answer the questions, you don’t have to participate in the programs. I recently applied for life insurance and they made me answer questions about my health. I thought insurance companies can’t do this anymore? Read more information about health care reform. Our consumer experts can answer your questions about any type of insurance. They are available by phone at 1-800-562-6900 or by submitting an inquiry through our website. Today, we issued our fourth report on the number of Washingtonians who have no health insurance. At the end of 2012, some 990,000 people -- approximately 14.5 percent of the state's population -- were uninsured. The number of uninsured people in Washington grew by more than 44,000. Four out of five people with individual insurance were underinsured, meaning they had plans that only paid for 25-40 percent of their medical costs. Employer-sponsored coverage grew increasingly scarce. Uncompensated care ballooned to nearly $1 billion per year. The Affordable Care Act fully took effect on Jan. 1 and the uninsured rate is expected to drop to 6 percent by 2016. Early provisions of the Affordable Care Act prevented an estimated 100,000 people from joining the ranks of the uninsured prior to 2014. If your Super Bowl party gets out of hand or you find yourself with an unruly guest, our consumer advocates shared a general overview of what your homeowner insurance may cover. You should check your own policy to find out exactly what you are covered for. Generally, homeowner policies have two types of coverage that could apply. Premises medical (guest medical) is designed to cover medical expenses (each policy has its own limit) that occur from an on-premises, accidental injury. Premises medical is a more direct payment method to pay for, or reimburse, the injured guest for related medical expenses. Liability would cover an injury to a guest if the homeowner was found to be negligent, and the negligence was the cause of the injury. For instance, if a homeowner failed to repair a falling-down porch and a guest was injured on it, the liability portion of the policy could cover the injury. If an unruly guest damages your home or your belongings—such as a beer bottle launched at the TV after a bad play—it might be classified as vandalism and covered by your policy, subject to the policy deductible. The homeowner’s insurer may seek collection action against the unruly guest for reimbursement. The guest may have his or her own homeowner policy that includes liability coverage; however, it would likely not apply because intentional acts are excluded from personal liability coverage. If you have renter insurance, check your policy for what type of damage is covered and check your lease for what type of damage you are responsible for. Any time you invite guests to your home, whether it be a Super Bowl party or any other gathering, it’s your responsibility to ensure your home is safe and that your guests are reasonably safe. That includes being responsible with providing alcohol to your guests, making sure there are no obvious hazards and generally taking the same precautions for your guests’ safety as you do for your own. Before the game, talk to your insurance agent about what is and what is not covered in your policy. You can find more information about home insurance on our website. Enjoy the Super Bowl and go Seahawks! Some Washington health-care enrollees have not yet received proof of their insurance coverage. As a result, many consumers are unsure if their medical treatments are covered. If you recently bought a plan, but still haven’t received proof of insurance from your insurance company, Insurance Commissioner Mike Kreidler offers these tips. Since open enrollment began on Oct. 1, insurance companies have encountered multiple problems that have prevented them from being able to enter new members into their systems. Some companies received incomplete or incorrect information from the insurance marketplaces. Other companies were overwhelmed with the number of applications they received and were unable to process them by the time the new plans went into effect. This delay in providing proof of coverage has many consumers worrying if they really have insurance and wondering what to do next. The first thing you should do is contact your insurance company to verify that you do have insurance coverage. Ask your company for proof of coverage, such as an insurance card or identification numbers. When you speak to your company, take detailed notes of the conversation. Include the date and time that the conversation took place, and the name of the representative you speak to. Keep copies of any written communication you receive, such as emails or letters. You may need these materials later. If you are not sure how to contact your plan, our website has contact information for each of the insurance companies that sells plans through Washington Healthplanfinder. You should also verify that you have paid your first premium on time. Some insurers have permitted late payments for coverage retroactive to Jan. 1. Find out your insurer’s deadline and keep any records that can serve as proof of payment. If you are about to buy coverage from Washington Healthplanfinder, print any paperwork or confirmations that you receive during the enrollment process. If you know you don’t qualify for a subsidy through Washington Healthplanfinder, you may find it easier to buy insurance directly a broker or an insurance company. Here’s a list of the plans that are available in Washington. Remember, 2014 open enrollment for most plans ends on March 31. You may need to get a prescription filled or see your doctor before you receive your insurance card. Your medical provider (hospital, doctor, pharmacy) may be able to verify your coverage by contacting your insurer directly. If they cannot verify your coverage cannot be obtained, you still have options. One option is to pay for expenses out of pocket. Once your insurance coverage is established, your insurance company should reimburse you in accordance with its established fees for services, minus any deductibles and copayments you are responsible for. You may also be able to work with your doctor’s office, hospital or pharmacy to delay payment or set up a payment plan until they can verify that you’re insured. Keep your receipts and any bank statements that show that you’ve paid for the services. The Insurance Commissioner doesn’t administer Washington Healthplanfinder, so if you purchased insurance there, your best bet is to contact their customer service staff if you have questions about whether you are covered. Does homeowner insurance pay for fixing a botched home repair job? My contractor did poor repair work on my home, and my insurance company won’t pay for fixing the work. Doesn’t my insurance have to pay for it? Consumers often ask us about this. Unless your insurer gave you no choice but to use its recommended contractor(s), the answer is no. If you chose the contractor, then the resolution will be between you and the contractor. If the contractor does not fix the work, then you may need to seek legal advice about your options. Generally, a contractor will try to resolve such issues, so we recommend that you first try to work it out with your contractor. By the way, the situation is the same for auto repairs. If you chose the repair shop, then resolution needs to be between you and the shop. If you chose a shop recommended by your insurer, then we would expect your insurer to help you resolve the issue. Learn more about understanding home insurance or auto insurance. You can report consumer issues to our experts at 1-800-562-6900 or by viewing Talk to an Insurance Expert. While the rollout of the Affordable Care Act has not gone as smoothly as hoped for, the doomsday talk is something that should be considered with a good helping of skepticism. That’s the word from insurers. "Don’t believe the hype: Health insurers think Obamacare is going to be fine" is the recent headline from the Washington Post. Bosses at some of the big-name companies said they expected the initial stages of health-care reform to be rocky. They stress patience. That’s the same message that Commissioner Kreidler delivered to Congress about five weeks ago when invited to testify before a House health-care subcommittee. And when asked Jan. 17 by the host of Northwest Now about any concern in our state about the enrollment of the "young invincibles" – people under 30 – Kreidler, the nation’s longest-serving elected insurance commissioner, again urged patience. Two to three years of experience are needed to make informed judgments, he noted. Learn more about what the commissioner had to say during his interview about health-care reform at KBTC’s Northwest Now website.. The Seattle Times covers the Wahealthplanfinder's new plan to reach the young uninsured through a partnership with global concert promoter, Live Nation. Read about the plan to bring enrollment opportunities to concerts, festivals and other events across the state. The federal government announced today that it was extending the deadline for people enrolled in the federally-run Pre-existing Condition Insurance Plan (PCIP) to find new coverage. Consumers in this program now have until March 31, 2014 to find new insurance. If you're enrolled in this plan, expect to get a letter in the mail explaining the new deadline and details on cost-sharing. Get more information about PCIP. Striking a balance of price and reasonable access to quality medical care is an evolving issue nationwide, Insurance Commissioner Mike Kreidler told a leadership gathering of the American Medical Association on Jan. 10. The key topic for the panel on Jan. 10: How insurance regulators, medical providers and insurance companies can guarantee patients access to quality care. Kreidler said that he noticed a trend by insurance companies last summer to develop “narrower networks” of doctors and hospitals in the new health plans they offered for the first time on Washington’s Health Benefits Exchange, which manages the Washington Healthplanfinder. That’s the online site where consumers can shop for 46 health plans and, in many cases, get subsidies to help pay for premiums. Consumers can also choose from 51 plans in the outside market, where subsidies are not available. Although narrower networks are found in these plans as well, the concern is more prominent in the Exchange. In some cases, insurers did not contract with doctors and hospitals that had traditionally been part of their networks. The new business model emerged as a way for insurers to keep premiums as inexpensive as possible for consumers. This development has raised a red flag for consumers and doctors alike. Kreidler recognized the issue when insurers began filing new plans last year. His office is now developing further guidelines to make sure that consumers have reasonable access to services. More transparency about which doctors and facilities are included in the plans is another key aspect – for both consumers and the medical community. His office has already received many comments from consumer groups, doctors, insurers, Indian tribes, legislators and more. Draft rules will be ready in February and will be open for more public scrutiny. Kreidler noted that this is just a first step. 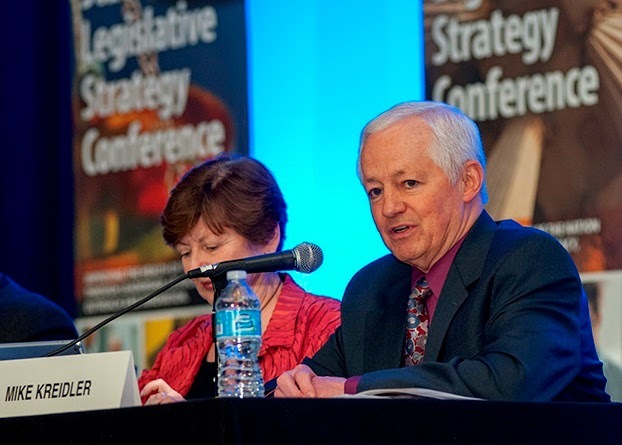 Insurance Commissioner Mike Kreidler will offer his views at the American Medical Association's State Legislative Strategy event Jan. 10 on how the Affordable Care Act is changing the way insurance companies and medical providers offer services to consumers. Key topic for the group: How insurance regulators, medical providers and insurance companies can guarantee patients access to high-qualify care. I paid my first health insurance premium, but I don’t have an ID card. What do I do? Yesterday, consumers were able to start using their insurance under the Affordable Care Act. Washington consumers can sign up using Washington Healthplanfinder. While the Insurance Commissioner doesn’t administer the Washington Healthplanfinder, our consumer advocates are hearing from a lot of people who have completed their application and paid their first month’s insurance premium, but haven’t yet received their new insurance card or plan information. People want to know what will happen if they need to use their insurance before they get their insurance card. Medical providers need your insurance ID number to bill them for your care; they don’t need the actual card. If you paid but do not yet have an ID number, you should contact your insurance plan and ask for that information. Your plan can also tell you when your card will likely arrive. If you feel more comfortable having a card, you can ask your company to tell you how to print a temporary ID card. If you pay out-of-pocket for medical care because you don’t have ID number, you can submit a reimbursement request to your insurance company.